Summerhill’s new CD project, “Shine On Through”, is the latest collaboration with her long time friend and producer Kate MacLeod. It features many of the same musical friends who were included on her debut recording: “The Roots Run Deep”, as well as some fun surprises. “Shine on Through” was self-released through Sky & Earth Music, to radio stations across the USA, Canada & to some stations Internationally. In February of 2004, her second full length recording of original songs was listed at #16 out of 70 CD’s surveyed on the Folk DJ list. Of her debut CD release, “The Roots Run Deep”, Independent Songwriter Web-Magazine writes: “The emotional bond is established with the audience from the very first note. It’s personal, yet universal. You may cry, you may find yourself becoming philosophical, but you will feel something totally unique from any other album you’ve ever heard.” Anke’s diverse background and powerful gift of observation has seasoned her songwriting and performances with that, which makes us compassionate. When the family moved to Vancouver, British Columbia, Summerhill finished high school in a visual & performing arts program, where she began to study drawing and guitar. Although initially too shy to sing in class, it was the study of various vocal styles and the love of singing that eventually coaxed her to pick up the guitar, so she could accompany herself. Travels throughout the U.S. led Anke to settle in Salt Lake City in 1985, ( by way of Colorado, Oregon, Florida and Texas ). She soon signed on as a vocalist in the eight-piece ensemble Chenaniah and toured throughout the West. 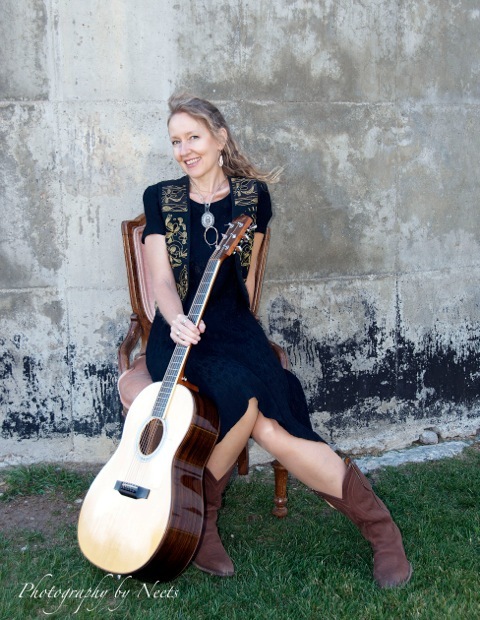 Songwriting was a natural extension of her passion for singing, and her own songs first found expression as part of the duo, Stillwater, which she co-founded in 1988. Striking out on her own in 1996, her songwriting met with immediate success, as she was named a finalist in the Kerrville (TX) New Folk Showcase, selected from a field of nearly 800 singer-songwriters nationally. Her songs were chosen again for the 1999 Showcase. Her first full-length CD project, “The Roots Run Deep,” was produced by Waterbug/Folk Era recording artist, Kate MacLeod, whose vision clearly had a major impact in shaping the package for Summerhill’s honest & excellent writing. It is a mature, fully developed concept that features MacLeod’s talents on fiddle, plus tasteful guest performances by Carla Eskelsen, Matt Flinner, David Grier and David LaMotte. The musical talents of Matt Larson, acoustic bass; Michael VanDam, cello; Christopher Carlson, fiddle; Ray Smith, alto flute; George Grant and Barry Carter, percussion, round out a full sound that doesn’t obscure Summerhill’s performance. The album opens with two very strong songs of quite different character. “From Up Here,” a wistful anthem written after leaving the Kerrville Music Festival, has an infectious rhythm and a lyric that moves as freely as its subject: flying home after great adventure. “Stillness of the Night” handles its theme — death and loss — with uncommon tenderness, and an aching, poignant melody. Songs about the plight of parted lovers are a dime a dozen in today’s pop-music world. “Long Way From My Window” is a gem that takes a fresh look at this common subject, and shows off Summerhill’s talent for unique imagery, a strength of the album throughout. Summerhill’s affection for Utah’s grand landscapes makes its appearance twice, in “Raven” and “Stars at Noon,” capturing perfectly the beauty and character of desert wilderness. Other strong points include a blues tune, “Rainbow Blues,” that is as clever as it is unexpected. The closing selection, “Harvest Moon,” is a rich celebration of home and family. Although written about her childhood in Germany, it contains a universal appeal that might be transplanted easily to the rural heartland of America.